IN RECENT YEARS, MEMORIES OF PAST THANKSGIVINGS come to visit at Thanksgiving time, like welcome spirits, filling the house with smells, sights, sounds and stories of long ago times with family and friends around the family dining table. – When family gathers now, we share the old stories, visit familiar traditions and renew family bonds once again. taking directions to prepare the feast. then run off to play with siblings and cousins. arranging artfully on the turkey platter. as head of our family. to fetch a forgotten spoon. china, silver, crystal and cloth napkins. and a pitcher of ice cold ice tea (sweetened of course). butter pecan ice cream added later. finishes with a toast for health in the coming year. in gratitude for their traditions and sated stomachs. 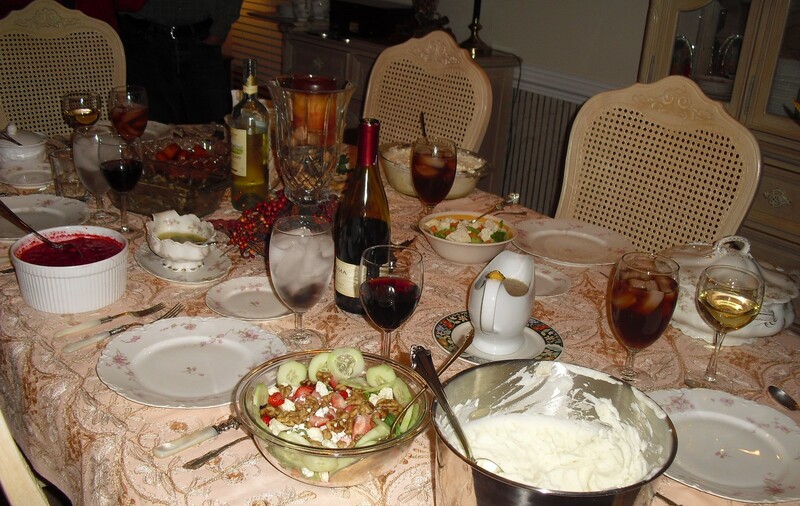 IN MY HOME, I have continued familiar traditions, and serve many foods shared over the years at the Thanksgiving tables in my parents home. I use Mom’s green bean recipe for perfect green beans, and serve turkey, mashed potatoes, lots of cranberry sauce, hot rolls, dressing and iced tea, pumpkin and pecan pies and cookies and ice cream. I HAVE MADE A FEW CHANGES and additions over the years: reduced the calories in the sweet potato recipe, and served additional lower calorie dishes as options, for example, wild rice with cranberries; field greens salad with raspberries and toasted walnuts and goat cheese; sliced cucumbers with onions and tomatoes drizzled with olive oil, basalmic vinegar and oregano. I also serve ham for some family members who prefer it to turkey and a wine option with the iced tea. The past 20 years, I have served my mother-in-law’s holiday pineapple salad (loved by my family) and occasionally make her delicious squash casserole dish – thus incorporating traditions and memories from my husband’s family. THIS THANKSGIVING, we will once again gather together at the holiday table. I am thankful for traditions past – and blessed to be engaged in passing them on. Previous PostWhen Grieving Hangs Over ChristmasNext PostHow Do You Decorate Your Tree?